Friday, April 13, 2018 Event begins at 6:00 PM and will end at 9:00 PM. The Art Walk is free. MAG sells wine tasting tickets. 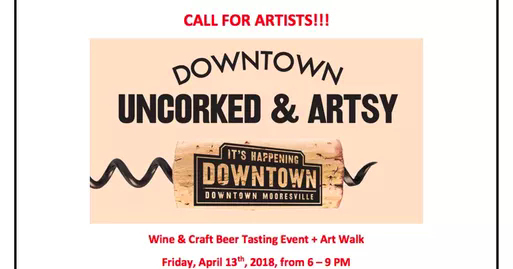 This is a great opportunity to showcase and/or sell your artwork in downtown Mooresville! This event is growing, and we anticipate an even better crowd for this year! There is no commission taken and no fee to participate. You will set up your exhibit in front of/ to the side of one of the businesses on Main Street or Broad Street. You will be assigned to a location. Once assigned, artists are encouraged to visit the site and speak with the business owner about setup logistics. Artists should arrive at 5:00 PM or earlier if you wish. This will allow you plenty of time to locate your spot and set up. You must be ready for the evening at 5:30 PM. You MUST bring a BATTERY POWERED light source, twinkle lights, small lamps, etc to illuminate your area when it gets dark.